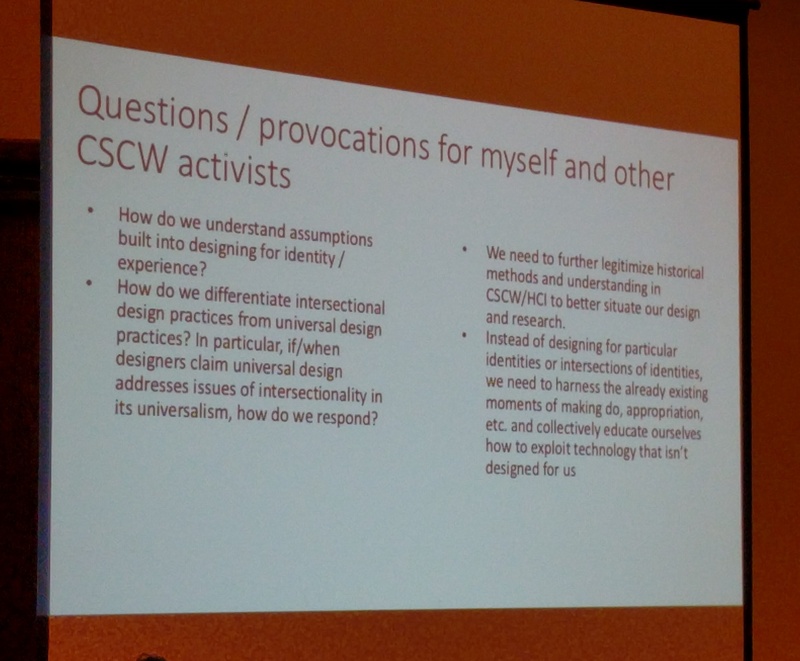 This is a liveblog of the Social Justice and Design panel at the CSCW 2017 conference. 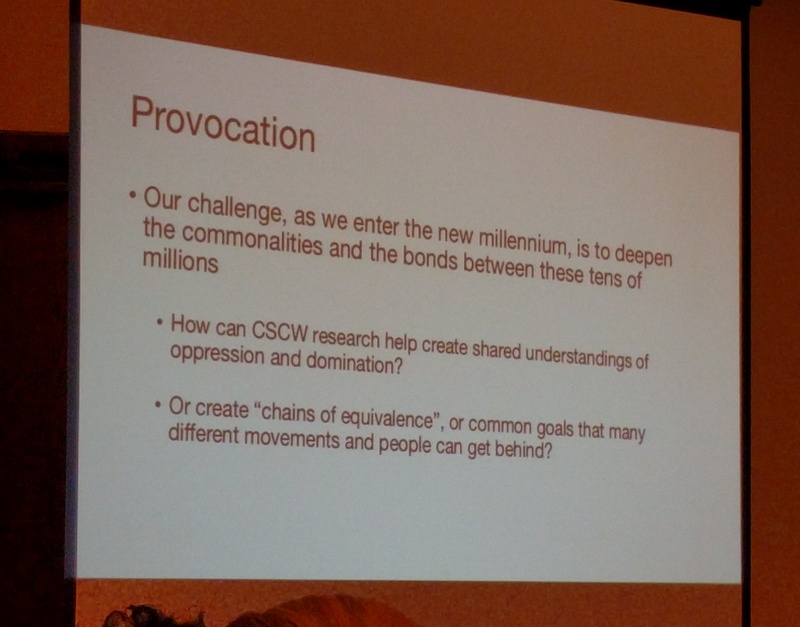 How do we consider CSCW research and activist through personal stories? Bardzell wove her own personal story as a researcher with one of the online activists she studied. In 2011, Bardzell’s research subject Peggy from Taipei had to take care of her father after a medical emergency in Vietnam and was quickly overwhelmed. Before meeting Peggy, Bardzell, from 1992 to 2008, left Taiwan went to the United States for graduate school and fell in love with it. But most importantly and personally, she was fleeing a difficult domestic situation. Peggy struggled between 2011 and 2014 and chose to document her struggles through a blog. Her blog attempted to share health-related information to others and advocate for policy changes on the issues. The popularity of website climbed, and she was invited to give public talks on the topic. In 2014, the Sunflower Student Protests occurred in Taiwan. Bardzell calls them a “protest of enfranchisement” for young people. And the subversive hacker collective g0v.tw supported the protests by creating alternative information infrastructures. Peggy joined g0v.tw in 2014 with the hope that it would amplify the reach of her own work. Back in 2009, Bardzell was starting to prepare her tenure portfolio connecting topics of affective computing, domestic interaction, tech-mediated sexuality, and research through design. The common thread she found between concerns for gender, activism, and women she knew was: feminism. This wasn’t something she had considered before in her work and wrote the Feminist HCI paper to reflect on this question. What should/could feminism mean for the researcher and activist? Last year, Bardzell visited Peggy in Taiwan where she is now in the Taiwan federal government. She is helping design join.gov.tw as a new open democracy platform that offers opportunities for citizens to engage in policymaking and leverage open data. 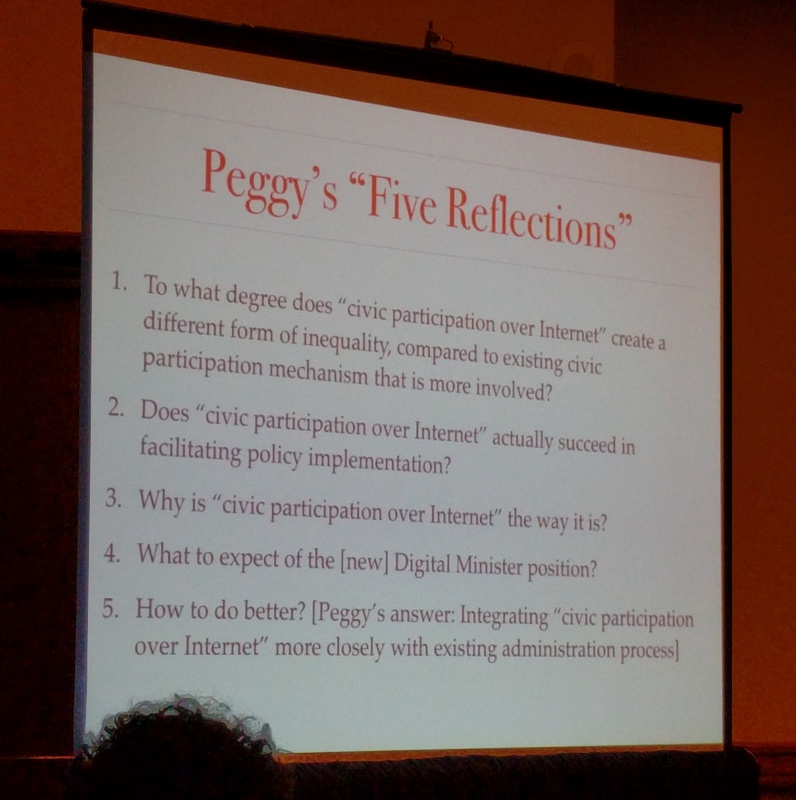 So how did Peggy end up in government after participating in a subversive hacker collective: the other g0v.tw organizers saw her talent for explaining difficult health information and wanted that to be part of a future government. Bardzell saw two parts of herself in Peggy. They both worked hard, but struggled as young Taiwanese women, and both aspired to better more effective version of themselves. They are both accidental activists. To Bardzell this is suggests a power in “utopic hope,” whereby critique leads to labor, which can effect community-building and direct action. HCI/CSCW research for social good needs to tell stories of hope and point to and motivate efficacious labor. Labors and stories of hope serve an epistemological purpose. Researchers need to understand / teach / strengthen / reward the epistemology of hope. Hope drives and orients our actions. Bardzell urges us to not just critique, and acknowledge the drive of hope as a kind of labor. And we need to think about how to craft invitations so that others can be fellow travelers in the effort of social justice. In this talk, Irani wants us to think about Lucy Suchman’s idea of “reconfiguring”: how do we transform the world into what we want together rather than relying on a master planner to design the intervention? Charting a course from the beginning of her graduate studies, Irani notes that she was looking at crowdsourcing and her frustrations with Amazon Mechanical Turk arose from classic feminist CSCW questions. Turkopticon started off as a class project, reflecting on the growing popularity of crowdsourcing with little regard for no minimum wage and other worker rights. Her initial research showed that workers complained that they had no agency in the system. She and Six Silberman created the tool Turkopticon as not a solution for the problems of crowdsourcing but a temporary collaboration with workers in solidarity with them. At the time they weren’t sure it was HCI research but at least it was useful. What they learned was that their attempt to learn about these issues was twisted by journalists into an activist cause in which technologists saved duped micro-workers. After feeling bad about the coverage, Irani and colleagues worked to reframe the issue to put worker voices and interests at the front and only worked with journalists that would interview them first if interested in the topic. We as a design community need to think about how we are positioned as privileged entities that allows to do certain work and get press for it. This is part of the same system devaluing Mechanical Turk Workers as commoditized and robotic while the technologists design the platforms on which they work. Dynamo takes the next step to think about this as movement-building. Evidence of this transforming practice is in how Six Silberman has gone on to work with a labor organization in Germany to develop systems that honor crowdsourced labor. Irani implores us: don’t just critique but work on ways that we can reconfigure systems that redistribute the power toward labor. Computer scientists like to build fast and dream big but that isn’t exactly how organizing works. How do we recognize the cultural power of the rhetoric we use like innovation. How should CSCW think about the distribution of financial value that our systems create? In Q&A, Cliff Lampe notes that CSCW has often been on the side of management as opposed to workers, and wonders whether we are inextricably linked to that or can we subvert it? 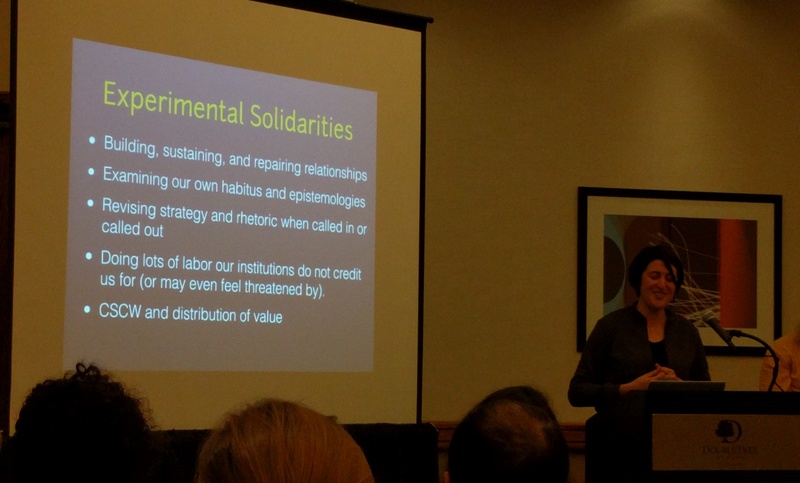 Irani responds that social justice projects like Turkopticon often don’t look like a CHI paper or a CSCW paper, and she questioned her work because of that: We should examine our doubt and ask why aren’t they papers at these conferences? There is a history of the homosocial practice of “cruising” documented as early as 1700 in the Old Bailey Courthouse Proceedings. The practices are associated with particular locations—so context matters when you make a look at someone or say something specific. The art of this exchange is passed by word of mouth and by accident. Queer locations were not just ephemeral but permanent gay business and neighborhoods. This is important because location (as a form of information/knowledge) is power. Location-based social networks (LBSN) arising from GPS-capable phones. Grindr was possibly the first LBSN in 2009 to solve the problem of gay men finding each other and solving the location problem. This creates a network of people grouped by location, empowering them as a community. There is a strong value in qualitative work but also putting that in a historical context. Queer HCI (Hardy and Lindtner 2017) is about accounting for the many ways in which experiences of queer subjectivity through technology happens at the intersection of design decisions and use.” Hardy wants to use more participatory and ethnographic approaches to understanding how designs are situated. This important because often design is pitched as universal and thus can apply to intersectional spaces. We need ways to respond to this argument. 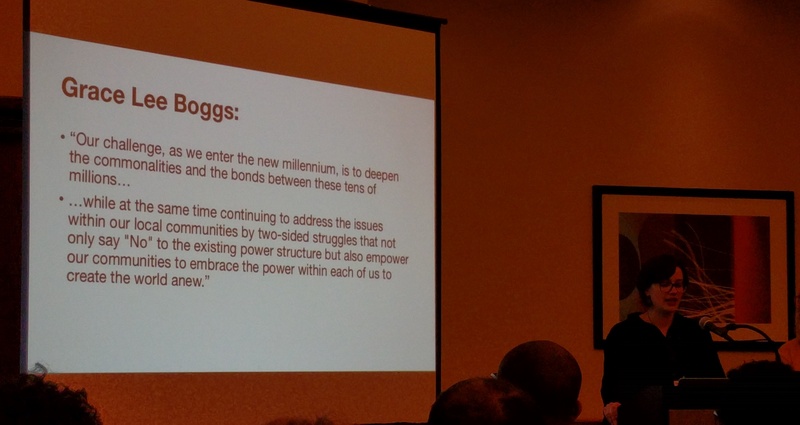 Philosopher Grace Lee Boggs and the Detroit social justice efforts inspires Dimond’s work. In her work, she takes on two-sided struggles in two ways. First, she wants to say “no to existing power struggles.” This is how Dimond thinks about her work in street harassment. She built tools (Hollaback!) with activists to collect stories of street harassment. The goal was to tell stories in a way that can illustrate this is a serious, global problem, whereas it’s often dismissed or ignored. Dimond also wanted to create a similar system that allowed for sharing stories of online harassment. HeartMob not only allows you to share the story but tap into a network of other Heartmobbers for peer support. Users can take action by: documenting abuse, notifying platforms, and sending supportive messages. The next evolution of fighting in two-sided struggles is to “embrace the power within each of us to create the world anew.” So Dimond founded Sassafras Tech Collective as a worker-owned tech consultancy. It’s a democratic workplace with flat hierarchy. They use Loomio for consensus-based decision making. They are researching tools for healthy conflict, peer evaluation, and accountability. And they need to think about how soft power arises, exhibiting the “tyranny of structurelessness”. Dimond also lives in a co-housing arrangement in Ann Arbor: 50 people live in a shared, interdependent community. Sassafras developed Gather to help the co-housing community organize themselves democratically. The ask for CSCW is to think about platform cooperatism and how users can have ownership in the governance of their online spaces.